It might look like a monstrous set of headphones, but the WHILL is actually an electric drivetrain designed to clamp onto manually powered wheelchairs, temporarily giving them a powered boost when longer distances have to be traveled. 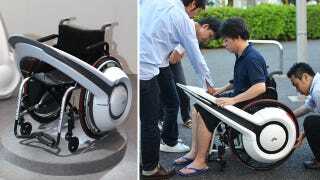 The prototype—which was recently demonstrated at the 2011 Tokyo Motor Show—features a round hub on either side that attaches to the inside rims of the wheelchair's wheels. Each hub houses a 24 volt electric motor powered by a rechargeable lithium-ion battery that's good for about 19 miles before requiring a two hour charge.